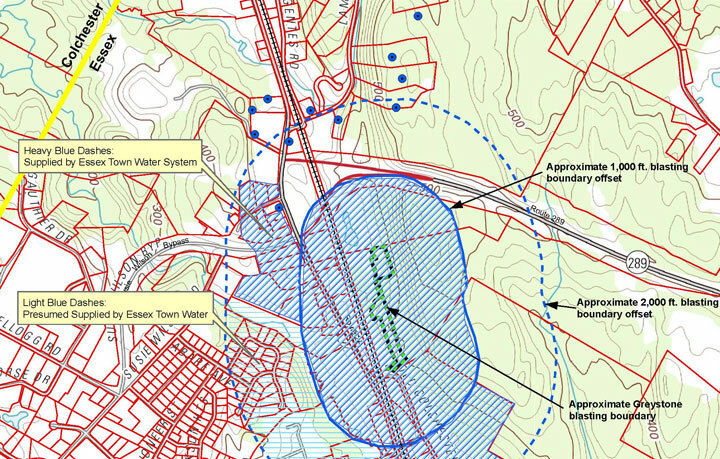 WHEM worked with O’Leary-Burke Engineers in 2016 to assess the potential impacts from a proposed blasting project would have on the surrounding watershed in reference to the VT ANR document titled “DRAFT Procedure on Participation in Act 250 and Section 248 Proceedings regarding the Use of Explosives and the Potential Impact on Groundwater” (2-07-2013). The blasting is part of the process of operating a rock quarry on the property. Over the course of the assessment, WHEM determined based upon the hydrologic and geologic setting of the proposed blasting site and surrounding area, as well previous studies completed for historic blasting projects in the area that indicated a lack of detrimental effects to surrounding hydrologic features, that the proposed blasting project would not have undue adverse impacts on water supplies or natural water resources. The project went on to obtain Act 250 approval and is in operation.